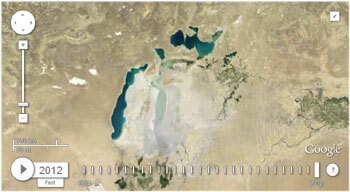 Google has launched an online service Landsat Annual Timelapse, which allows observing the changes in the Earth landscape that have occurred since 1984 based on satellite maps. 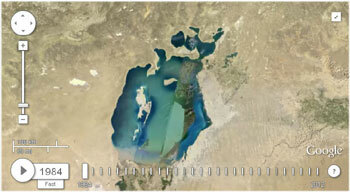 The service allows viewing the satellite images one by one, indicating a particular year of shooting or their sequence in the animated form, i.e. in this mode, pictures are downloaded one-by-one in chronological order (like slide show). Download speeds of satellite images can be controlled by selecting time for the change of images: 'fast', 'medium' or 'slow'. Maximum level of approximation to the planet's surface and image resolution of the photographs captured from the orbit are enough to determine the expansion of city boundaries, moving the sandbanks along the river or to follow the construction of the 'Palm' Islands in Dubai.